Battleships were a symbol of naval dominance and national might, and for decades the battleship was a major factor in both diplomacy and military strategy. 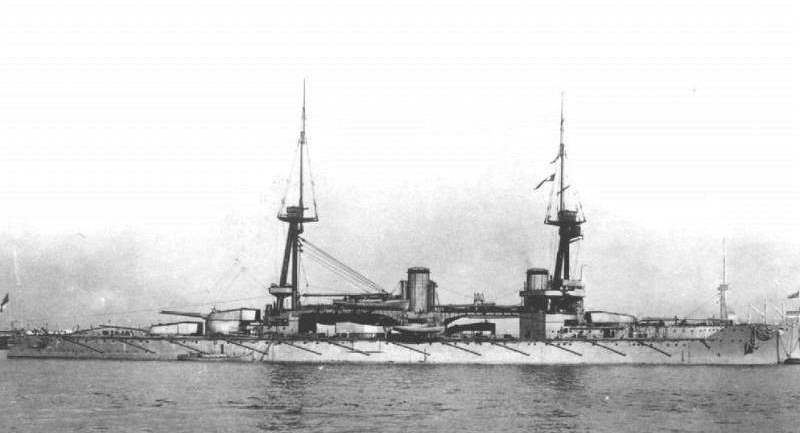 The launch of Dreadnought in 1906 commenced a new naval arms race which was widely considered to have been an indirect cause of World War I. The Naval Treaties of the 1920s and 1930s limited the number of battleships, though technical innovation in battleship design. HMS Camperdown was a Battle class destroyer built at Portsmouth Dockyard and launched on the 24th November 1885. Due to the delay in the production of her main armament guns she was not commissioned until July 1889. The Camperdown was flagship in the Channel Squadron in 1891. Camperdown was involved in collision with HMS Victoria on June 22nd 1893. During February 1902 she visited Portsmouth for repairs to to her steam capstand. After paying off in 1903, she was in reserve at Chatham until 1908, and was employed at Harwich as a berthing ship for submarines until she was sold in 1911. HMS Hibernia was a V11 Class Battleship built by Devonport Dockyard and was launched on the 17th June 1905. she served as the Flagship of the Rear Admirals of firstly the Atlantic Fleet and then the Channel Fleet. When the latter fleet was reorganized to the Home Fleet, she was based at the Nore. In 1912, Hibernia hosted trials in naval aviation with the temporary addition of a runway to her foredeck, and the first launch of an aircraft from a vessel underway was achieved from her in early May. Later in 1912, after her experiment with aviation was completed, she and her sister ships formed the 3rd Battle Squadron. The squadron was assigned to the Grand Fleet at the beginning of World War I, and served on the Northern Patrol. In 1915 she supported the Dardanelles Campaign and provided cover for the evacuation from the Gallipoli Peninsula. On returning to the United Kingdom she was again attached to the Grand Fleet before being transferred to Nore Command in May 1916, finishing the war as an accommodation ship. She was decommissioned in 1919 and scrapped in 1922. HMS Hotspur was a Victorian Royal Navy ironclad ram – a warship armed with guns but whose primary weapon was a ram. Hotspur was launched on the 18th March 1870 and commissioned at Devonport in 1871, and remained in reserve until 1876. 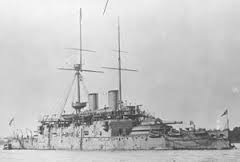 She served with HMS Rupert in the Sea of Marmara during the Russo-Turkish war of 1878. She the returned to Devonport, where she remained until her major reconstruction, undertaken by Laird & Sons Co. between 1881 and 1883. Her only active service thereafter was with the Particular Service Squadron of 1885. She was guard ship at Holyhead until 1893, was again in reserve until 1897, and was posted thereafter to serve as guard ship at Bermuda, where she stayed until sold. HMS Neptune was a Dreadnought Class Battleship launched on the 30th September 1909 by Portsmouth Dockyard, She was flagship of the Home Fleet from May 1911 until May 1912 when she was transferred to the 1st Battle Squadron, where she remained until June 1916, just after the Battle of Jutland. She was accidentally struck by SS Needvaal in April 1916 but no serious damage was done. She was present at the Battle of Jutland as part of Admiral Jellicoe’s Battle Fleet. She fired only 48 12 inch (305 mm) shells but is credited with scoring several hits on the German battlecruiser Lützow. Her captain was Vivian Bernard. After the war she was quickly transferred to the reserve fleet and subsequently scrapped. By the end of World War II battleships remained the most heavily protected ships afloat. However, in spite of their massive protection schemes, 16 were sunk or crippled by bombs or torpedoes delivered by aircraft. To make matters worse, the war had seen the development of the first guided bombs, which would make it much easier for aircraft to sink battleships in the future. HMS Princess Royal was built for the Royal Navy before World War I. Laid down in 1912 and commissioned in 1913, Princess Royal served in the Battle of Heligoland Bight a month after the war began. She was then sent to the Caribbean to prevent the German East Asia Squadron from using the Panama Canal. 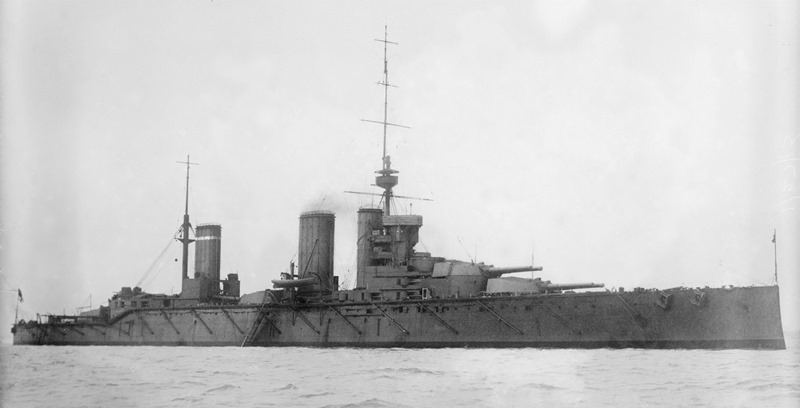 After the East Asia Squadron was sunk at the Battle of the Falkland Islands in December 1914, Princess Royal rejoined the 1st Battlecruiser Squadron. Princess Royal was moderately damaged during the Battle of Jutland and required a month and a half of repairs. Apart from providing distant support during the Second Battle of Heligoland Bight in 1917, the ship spent the rest of the war on uneventful patrols of the North Sea. Princess Royal was placed into reserve in 1920, then was sold for breaking up as scrap in 1922 to meet the terms of the Washington Naval Treaty.